Failure is a universal phenomenon, but it's one that makes you feel isolated and alone when it happens to you. When it comes to financial failures — from thwarted entrepreneurial ambitions, to poor investment decisions, to overwhelming debt — the feeling of failure is magnified by the fact that talking about money is taboo in our culture, and there are relatively few safe spaces to discuss your financial problems. But financial failure is just as common as any other kind of failure, and there is no reason to let it derail your path to success. 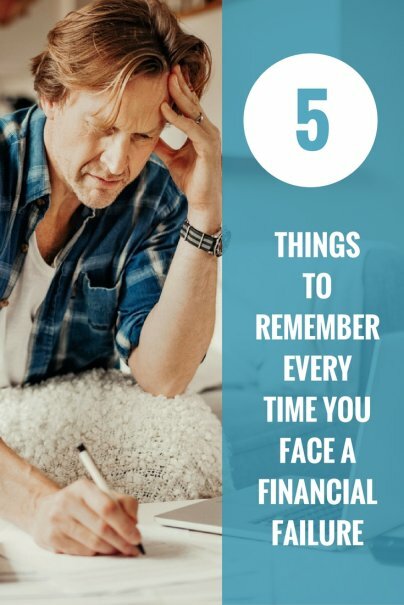 When you face a financial failure, remembering these key facts can help you pick yourself up, dust yourself off, and keep working toward your financial goals. Just out of my graduate education program, I applied for a teaching position at every school district within driving distance. I sent out about two dozen applications. I went on about four job interviews. And two weeks before the school year began, I landed an interview and a job at my preferred district. During that time, I beat myself up for all the districts that weren't calling me and all the interviews that didn't result in a job. But from the outside, my series of failures looked like me landing a job right out of graduate school at the district of my choice. Facing a series of failures before reaching success is a part of life, but no one other than you sees all of those failures. If you've tried over and over again to get the job you want, or tame your credit card debt, or qualify for a small business loan, no one other than you will be keeping a tally of the times it didn't work. You are the only person tracking your failures. Life is a little messier than in the movies. Moments of success do not end with a swell of music and rolling credits — and neither do moments of failure. Your life continues after you declare bankruptcy, even if your day-to-day life looks a little different from it did before your bankruptcy. That means no financial failure is the end of the story — unless you choose to let it be the end. Yes, you made some mistakes in the past that led to a big financial consequence, but you can always choose to get up each day after a bankruptcy, job loss, or disastrous investment, and get to work on rebuilding. If everything you tried came easily to you, then you would never feel anything but neutral about your success. It is failing at something that helps you recognize, enjoy, and be grateful for the success that comes afterward. Failure may feel pretty terrible, but it gives success its sweetness. This is especially true of the kind of behavioral changes you have to make to be financially successful. For instance, sticking to a budget is a difficult skill, and very few rookie budgeters are going to be good at it right out of the gate. Having several months where you blow your budget might seem like a failure worthy of giving up on budgeting altogether, but such blown budgeting months are part of your learning experience. If you're willing to learn from those mistakes, you'll get to a place where you know how to handle unexpected expenses, invitations, or financial problems without overspending. And it will feel so much better to succeed at your budgeting after learning from your failures than it would to have budgeting come easily to you. In the midst of a financial failure, it can be very easy to get discouraged and decide that you failed because there is something wrong with you. For instance, you might be furious at yourself for failing yet again to sign up for your company's 401K, or missing another due date for a bill. You might think that you can't do anything right because you've failed to do this task. But such global application of your anger at yourself is counterproductive and completely untrue. Instead, invest the time to think about the specific reasons why you failed. Do you feel overwhelmed by the decisions you have to make to sign up? Do you have too many bills to keep track of? Once you have pinpointed the specific reasons behind your failure, you can start to focus on what you need to do to rectify the situation, all while recognizing that you are not defined by your failure. Experiencing a job loss or other financial failure can be devastating no matter when it happens, but it is particularly tough when your friends or colleagues are doing well at the same time. Having to move back in with your parents after losing a job can already feel like a type of failure, but it can feel even worse if your best friend receives a major promotion and raise at work at around the same time. You might feel as if you're falling behind while they pull ahead of you. However, comparing your life to others' lives is a losing proposition, since there will always be someone doing better (and someone doing worse, for that matter) than you. You are not in a race to succeed, and there are no winners and losers — so don't let yourself feel bad because of where you are in relation to others. You are where you are, and you can find success from there. We all face financial failure at some point in our lives. Feeling devastated is perfectly normal, but don't let it be your only reaction to such a failure. Instead, remember that failure is just one of the steps on the path to success.